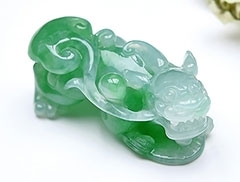 Every jade own one story,every jade design theme own a length of innermost words. Every one is the leading actor of the life and you have the right to decide your own life. Of course,you also have the right to decide your jade jewelry. 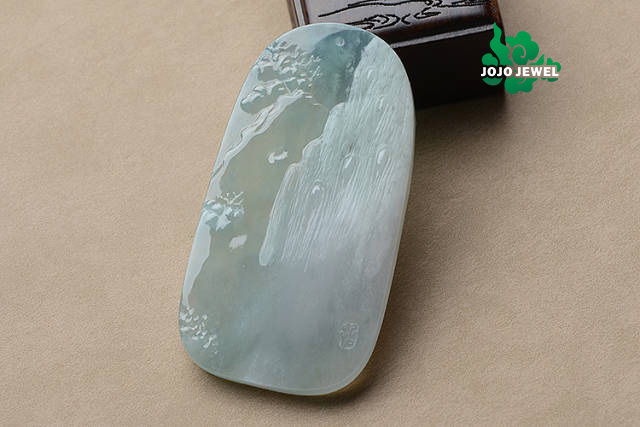 JOJO private customization service can give you the whole control on your jade jewelry. Our carvers listen to you. With our participation your own jade dream can come true easy. 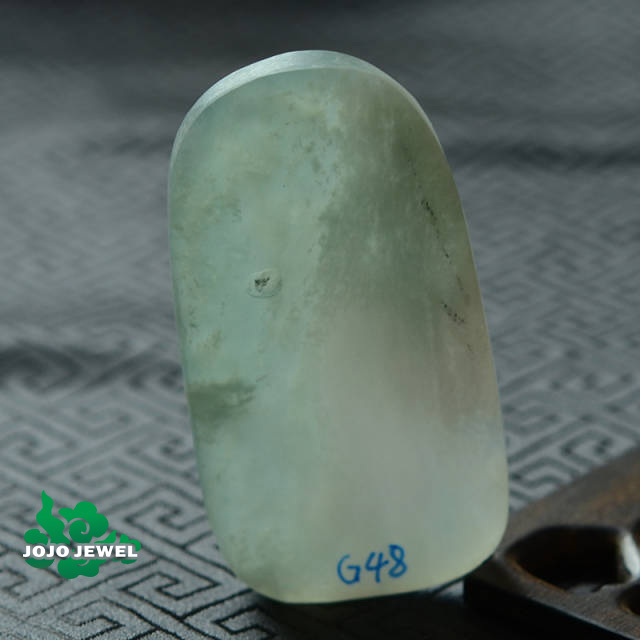 JOJO Jade can meet all your personal requirement to let you be the leading part of your jade jewelry. 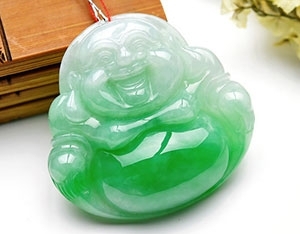 Perfect customized jade jewelry begin from the bottom heart. 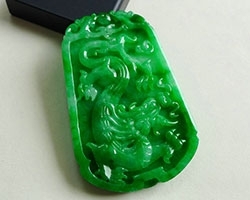 Just take the above picture shown customized jade jewelry for example to explain how the private customization come true. 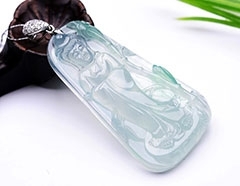 The customer want to customize one special guanyin jade pendant for his child. 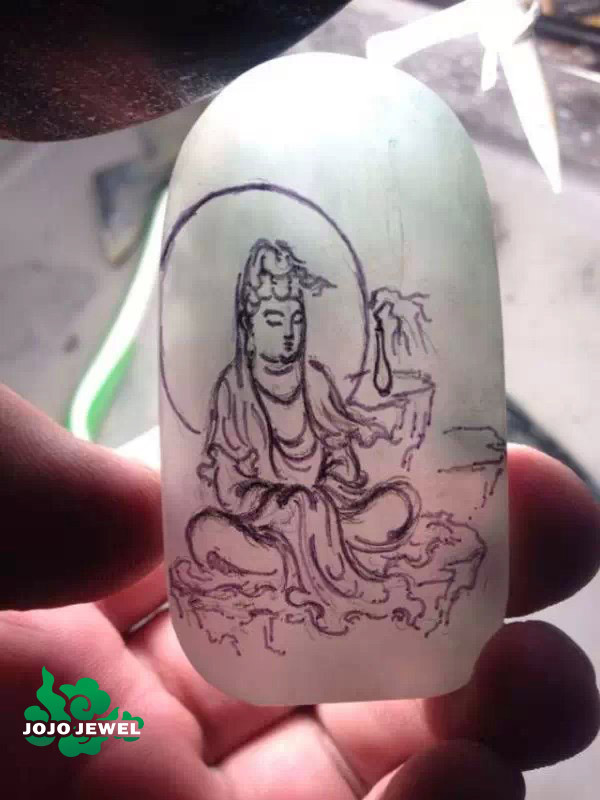 From our communication we know he want one design to show quiet guanyin character meanwhile own some special design to let his child feel jade carving art. 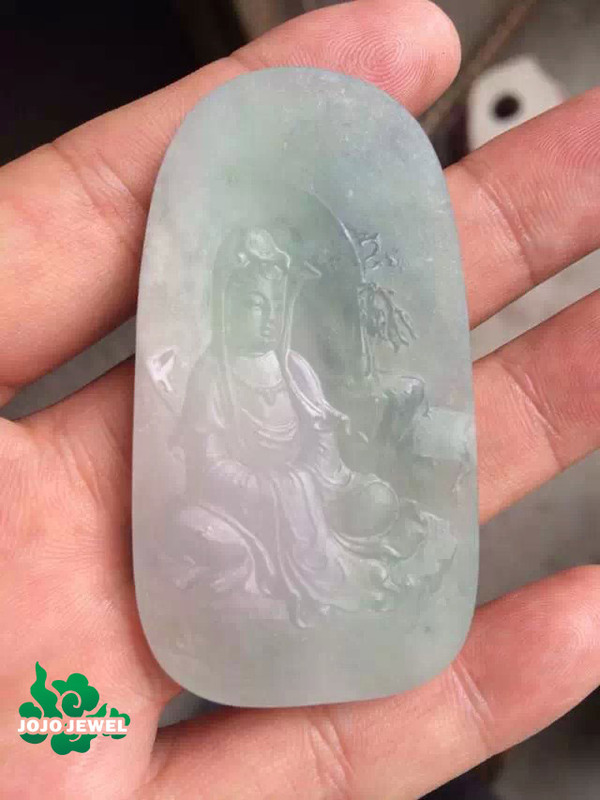 After careful communication on different jade material carving technique,different guanyin style,etc we choose one pure texture jade material which own part cotton on it. Our customer want to use that cotton to design one waterfall which get our full support. We always need around 7 days to make design on rough material because our carver have to design according to jade total result,jade vein and cotton trend then design In proportion. The whole process need constant scrutiny and modification which really need much time and mental support. 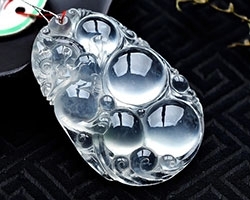 After careful design,what we can do is carving according to the design to make the design essence come true. 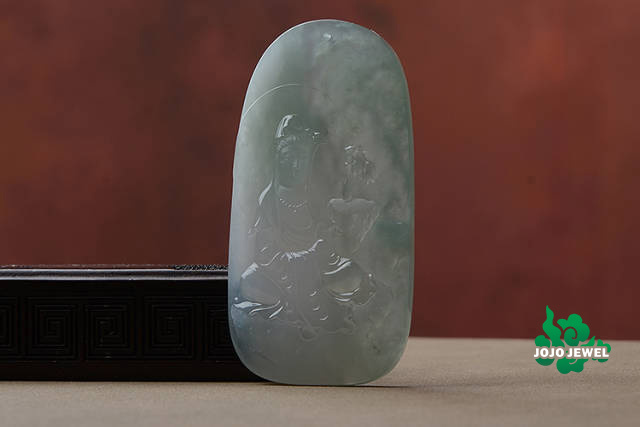 Jade carving art is achieved by careful carving on the jade to make people’s feeling in it,that’s what we call vivid design can make the jade own life in it. 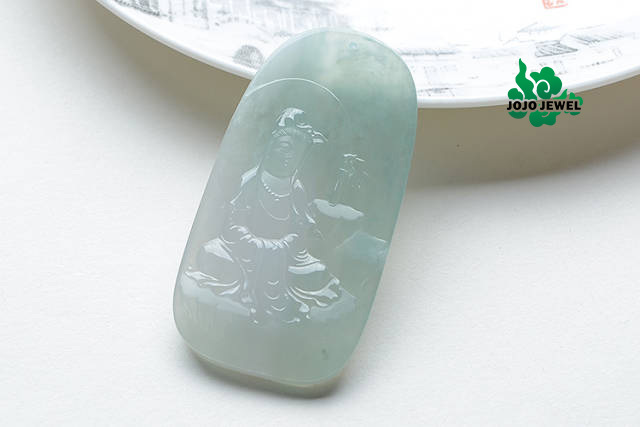 The carved out jade jewelry can show the final result after one very important polish process. 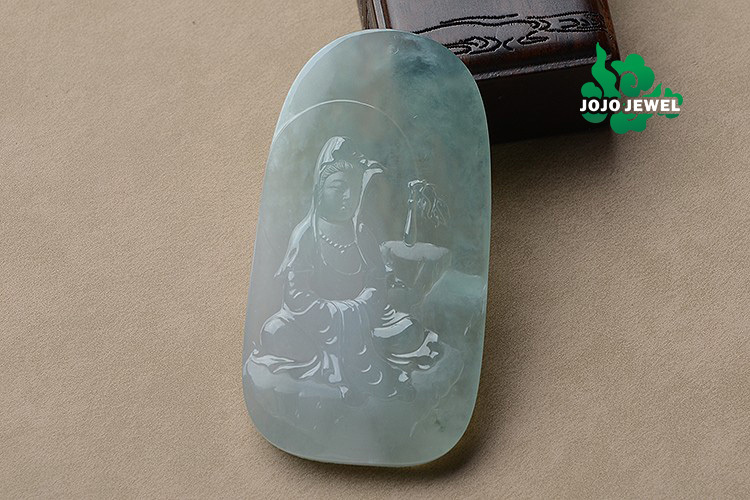 Only after careful polish then jade jewelry can express its intention well. 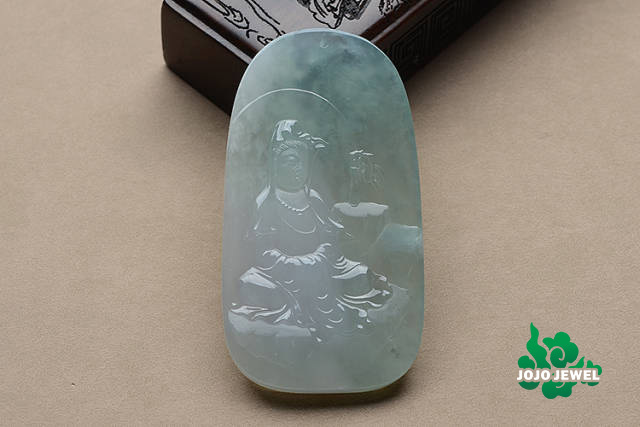 Polishing is the final process for jade carving but is the beginning for people to start enjoy jade natural beauty. 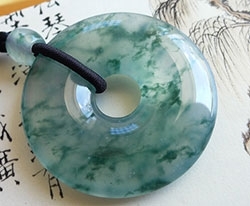 Now just enjoy the final result of one careful private customized jade jewelry. 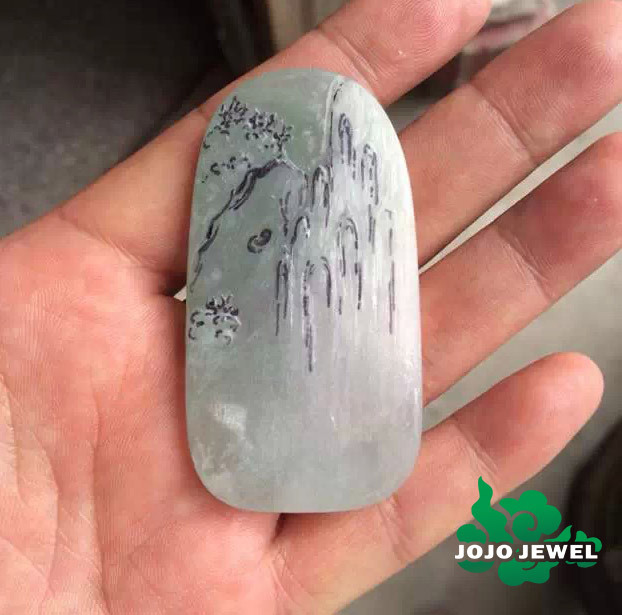 Whether the above example can arouse your inspiration on one special customized jade jewelry for yourself or for the ones you love? Just contact JOJO to let us help you make your thoughts come true. 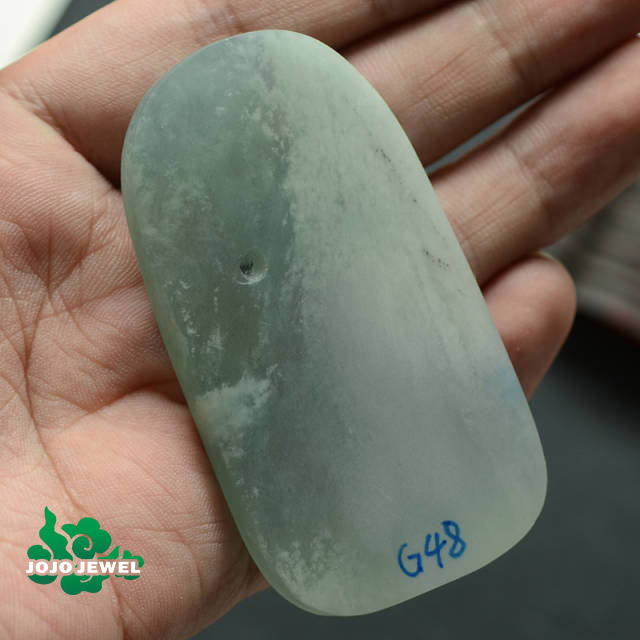 Now we only accept full color private customization like full white hetian jade,full green hetian jade ,full green jadeite,full white jadeite,full black jadeite,etc because full color jade jewelry can guarantee the total result well. Gold inlaid design can be provided by JOJO too. 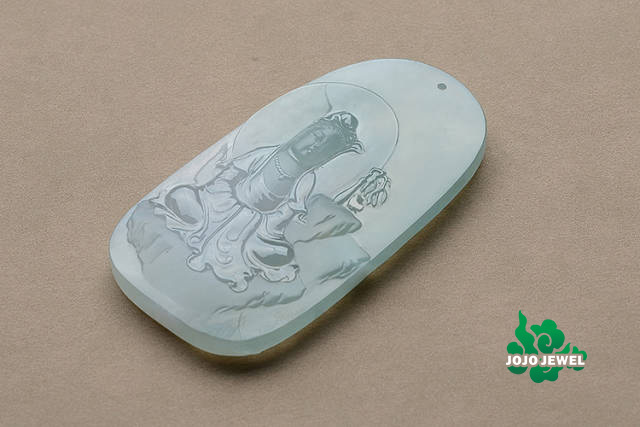 We will provide different gold inlaid design for you to consider if you let us know what jade style you want. 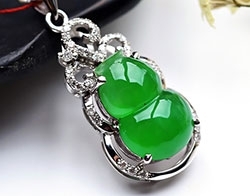 Really hope JOJO will be your final place to get your precious unique jade jewelry. 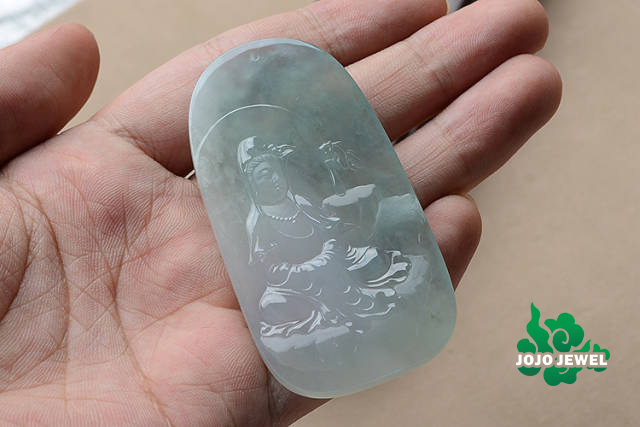 Our big jade jewelry supply together with so many carvers can make your unique thoughts come true easy and smooth. We believe we will meet your satisfaction. 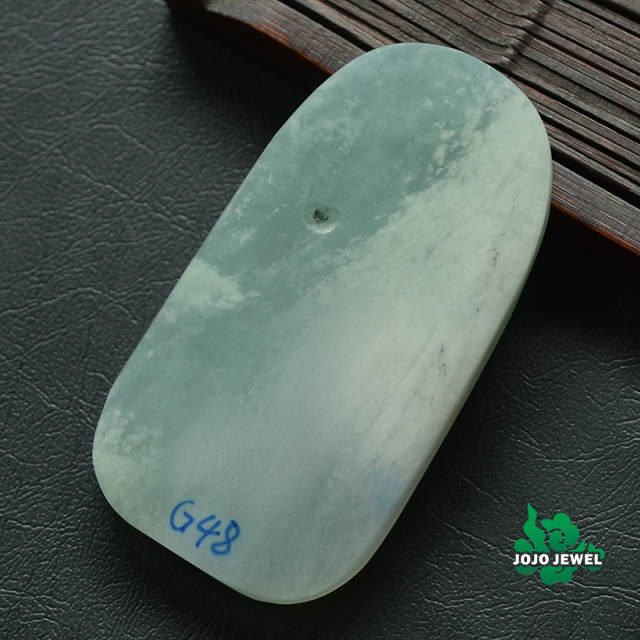 Our big quantity precious stock jade jewelry and so many return customers can prove our high ability to provide any your loved jade jewelry. 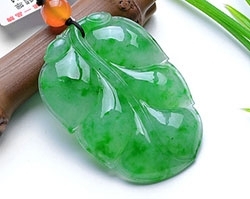 Contact Us to get your unique jade jewelry Now!